A documentary collection (DC) is a transaction whereby an exporter entrusts collection of a payment to the remitting bank (i.e., exporter's bank), which sends documents to a collecting bank (i.e., importer's bank), along with instructions for payment. Funds are received from the importer and remitted to the exporter through the banks involved in exchange for those documents. DCs involve using a draft that requires the importer to pay the face amount either at sight (i.e., document against payment) or on a specified date (i.e., document against acceptance). The draft gives instructions that specify the documents required for the transfer of the title to goods. Although banks do act as facilitators for their clients, DCs offer no verification process and limited recourse in the event of non-payment. Drafts are generally less expensive than letters of credit (LC). Under a DC transaction, the importer is not legally obliged to pay for goods before shipment. The exporter retains the title to goods until the importer either pays the face amount at sight or accepts the draft to incur a legal obligation to pay at a specified later date. Although a title to goods can be controlled for ocean shipments, it cannot be controlled for air and overland shipments, which allow the foreign buyer to receive the goods with or without payment. 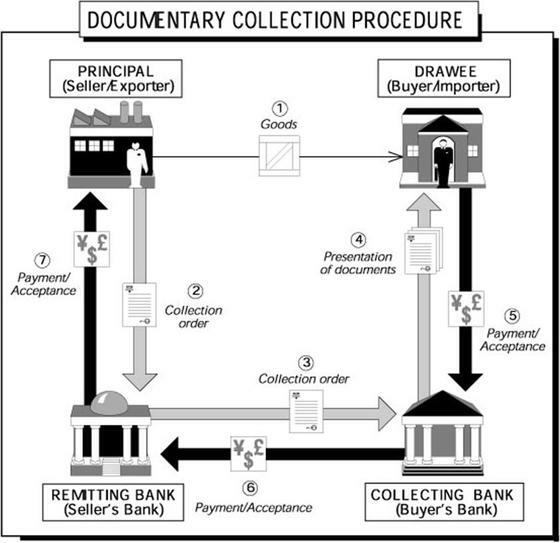 The remitting bank (i.e., exporter's bank) and the collecting bank (i.e., importer's bank) play an essential role in DCs. Although the banks control the flow of documents, they neither verify the documents nor take any risks. They can, however, influence the mutually satisfactory settlement of a DC transaction. An open account sale is considered too risky. An LC is unacceptable to the importer. The documentary collection procedure involves the step-by-step exchange of documents giving title to goods for either cash or a contracted promise to pay at a later time. The diagram below illustrates each numbered step. The buyer and seller agree on the terms of sale of goods by: (a) specifying documentary collection as the means of payment; (b) naming a collecting/presenting bank (usually the buyer's bank); and (c) listing required documents. The exporter/seller (i.e., principal) ships the goods to the importer/buyer (i.e., drawee) and obtains a negotiable transport document (i.e., bill of lading) from the shipping firm/agent. The seller prepares and presents (i.e., remits) a document package to his bank (i.e., the remitting bank) consisting of: (a) a collection order specifying the terms and conditions under which the bank is to hand over documents to the buyer and receive payment; (b) the negotiable transport document (i.e., bill of lading); and (c) other documents (e.g., insurance document, certificate of origin, inspection certificate) as required by the buyer. The remitting bank sends the documentation package by mail or by courier to the designated collecting/presenting bank in the buyer's country with instructions to present them to the buyer (i.e.,drawee ) and collect payment. The presenting (i.e., collecting) bank: (a) reviews the documents making certain they are in conformity with the collection order; (b) notifies the buyer about the terms and conditions of the collection order; and (c) releases the documents once the payment conditions have been met. The buyer: (a) makes a cash payment (by signing the draft), or if the collection order allows, signs an acceptance (i.e., promise to pay at a future date); and (b) receives the documents and takes possession of the shipment. The collecting bank pays the remitting bank either with an immediate payment or at the maturity date of the accepted bill of exchange. The remitting bank then pays the seller (i.e., principal). Although documentary collections, in one form or another, have been in use for a long time, questions arose about how to effect transactions in a practical, fair, and uniform manner. The Uniform Rules for Collections (URC) is the internationally recognized codification of rules unifying banking practice regarding collection operations for drafts and for documentary collections. The URC was developed by the International Chamber of Commerce (ICC). It is revised and updated from time-to-time. Useful reading includes the Trade Finance Guide of the US Department of Commerce and the website on Documentary Collections of the World Trade Ref.